"Approved Code No. 169--Amendment No. 1." Kansas City, Mo. : 1028 Baltimoie Avenue. Los Angeles, Calif.: le6s3 south Broadway. Minneapolis, Minn.: 213 -Pederal Building. New Orleans, La. : Room 1225-A, Customhouse. New York, N.Y.: 734 Oustomhouse. Administrator issues a subsequent order to that effect. which funds shall be contributed by Associations subject to the Code. Subsection (b) of Section 10 thereof. 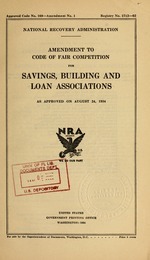 Associations subject to the Code. to and will not permit monopolies or monopolistic practices. For these reasons, therefore, I have approved this Amendment. if necessary to institute legal proceedings therefore in its own name. insignia of the National Recovery Administration. which the Administrator shall have so approved. Approved Code No. 169-Amendment No. 1.